Can the addictiveness of cigarettes be minimized by reducing their nicotine content? Can the addictiveness of cigarettes be minimized by reducing their nicotine content? This idea was first proposed as a public health measure two decades ago, but when the Food and Drug Administration (FDA) argued the case before the Supreme Court in 2000, they were not granted the authority. Times have changed, though, and in 2009 the Tobacco Control Act granted the FDA vastly greater regulatory power over tobacco products, including the authority to reduce nicotine if it is deemed likely to improve public health. But while small studies have shown the possible benefits of such a move, no large trial has compared the effects of regular- and reduced-nicotine cigarettes on smoking behavior, dependence, and subjective measures of smoking … until now. A large NIDA-funded study by University of Pittsburgh psychologist Eric C. Donny and colleagues, just published in the New England Journal of Medicine, provides important support for the benefits of reducing nicotine in cigarettes. From mid 2013 to mid 2014, 840 smokers at ten research sites were randomized to one of several groups who smoked their usual brand, an investigational cigarette with 15.8 mg of nicotine per gram of tobacco (similar to the content of most commercial cigarettes), or one of a few investigational cigarettes with a nicotine concentration ranging from 33 percent down to 2 percent of a typical cigarette. The cigarettes were provided for free, and the participants were paid for participating. Cigarette consumption per day was measured across the six weeks of the study (as well as a pre-study week to capture a baseline), and the final week data for the seven groups was compared as the primary analysis. Many participants also abstained from smoking for a day, following the six weeks, and their response to abstinence was assessed. The results showed a striking split in smoking behavior between groups receiving higher- versus lower-nicotine cigarettes (see graph below). Participants receiving and smoking the lowest-nicotine investigational cigarettes—with 0.4, 1.3, or 2.4 mg/g—smoked 23 to 30 percent fewer cigarettes than those receiving and smoking their usual cigarettes or investigational cigarettes with 15.8 mg/g and 5.2 mg/g. The latter is particularly interesting: A two-thirds (67 percent) reduction in nicotine did not alter smoking behavior, but an 85 percent reduction (or more) did. The New England Journal of Medicine ©2015. Number of Cigarettes Smoked per Day According to Nicotine Content. The mean number of cigarettes smoked per day was based on the number reported by participants with the use of an interactive voice-response system. Panel A shows the mean total number of cigarettes smoked per day, including both study and nonstudy cigarettes. Panel B shows the mean number of study cigarettes smoked per day. All analyses were adjusted for the baseline number of cigarettes smoked per day. 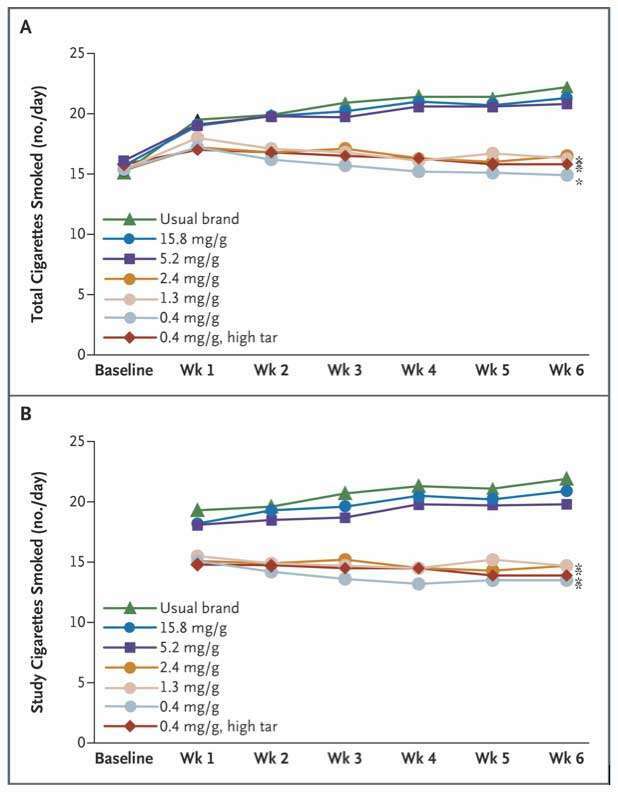 An asterisk indicates P<0.001 for the comparison at week 6 with the primary control cigarettes (those with 15.8 mg of nicotine per gram of tobacco. Participants also rated the subjective effects of the cigarettes. Those receiving the three lowest-nicotine cigarettes (but not the 5.8 mg/g nicotine cigarette) estimated that the nicotine content in their cigarettes was lower than a standard 15.8 mg/g cigarette, and they estimated that, at a price of $6.00 per pack, they would smoke fewer of those cigarettes per day (11) than would those smoking 15.8 mg/g cigarettes (17). Lower-nicotine cigarettes also produced lower scores on ratings of dependence and withdrawal at week 6. Participants from all groups were equally likely to complete a day of abstinence following week 6, and all had similar withdrawal scores during it, but those who had been smoking the lowest nicotine cigarettes (2.4 mg/g or under) over the previous 6 weeks had significantly lower cravings during abstinence. Nicotine is the main rewarding chemical responsible for the addictiveness of tobacco, but it is not the ingredient that causes cancer and heart and pulmonary diseases. This raises the question whether reducing nicotine would cause smokers to compensate by smoking more—and thus backfire as a health measure. Compensatory smoking has been found with so-called “light” cigarettes, which increase the ventilation of the filter but do not decrease nicotine. The new study did not support such a concern with reduced-nicotine cigarettes: There was no increase in cigarette use or compensatory smoking associated with the lower-nicotine-cigarette groups. Although smoking has steadily declined in the U.S. over the past half century, thanks to the many public health campaigns that followed the Surgeon General’s Report of 1965, we have a long way to go to remove this terrible health threat. Smoking still causes nearly half a million deaths each year in our country. Research now suggests that reducing the nicotine in cigarettes to a fraction of its current levels may be one way to lessen the health-destructive power of these products. NIDA. "New Study Shows Benefits of Reducing Nicotine in Cigarettes." National Institute on Drug Abuse, 5 Nov. 2015, https://www.drugabuse.gov/about-nida/noras-blog/2015/11/new-study-shows-benefits-reducing-nicotine-in-cigarettes. NIDA. New Study Shows Benefits of Reducing Nicotine in Cigarettes. National Institute on Drug Abuse website. https://www.drugabuse.gov/about-nida/noras-blog/2015/11/new-study-shows-benefits-reducing-nicotine-in-cigarettes. November 5, 2015.